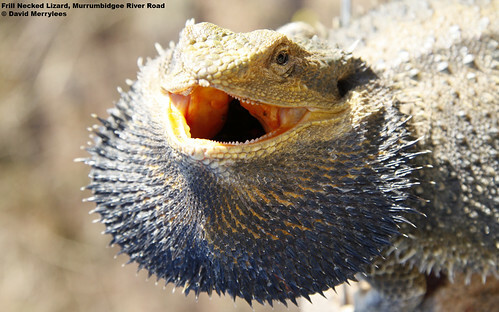 This photo of a Bearded Dragon was taken beside the Murrumbidgee River Road on the afternoon of 30 September 2009 by my friend David Merrylees. Download free 1680×1050 resolution desktop wallpaper of a Bearded Dragon. About the photographer: David drives down Murrumbidgee River Road morning and afternoon and often spots all sorts of wildlife, wedgetail eagles, lizards, snakes, emus and the less welcome kangaroos. An excellent pic! The internet would be a better place if people could post interesting pics. This is actually not a frilled neck lizard, it is a bearded dragon.